I know what you’re thinking — coconut bacon? I, too, used to assume that a vegan interpretation of bacon was pure folly. Few foods inspire the wholehearted adoration that bacon seems to receive, and few bacon lovers concede a substitute. 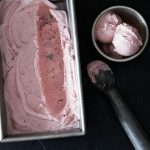 I’ve even seen t-shirts reading “vegetarian…except for bacon.” But, as with cashew cheese, banana ice cream, and so many other creative vegan dishes, there’s a way to capture the smokiness, saltiness and flavor of bacon. 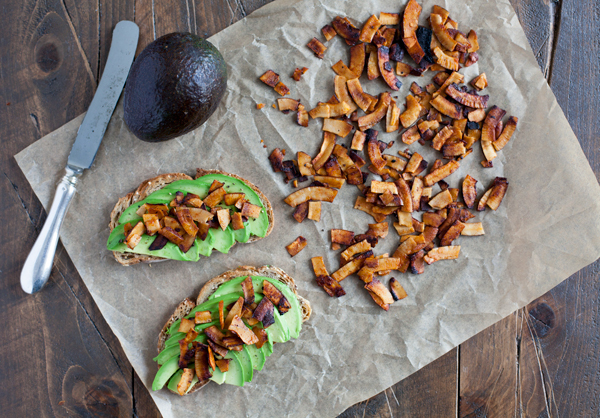 I realized this when I first discovered eggplant bacon, and now I’m discovering it with this easy vegan coconut bacon, too. I’ve had coconut bacon at raw eateries before. The ones I’ve tried were made with young coconut meat, but to me, that’s such a special and precious ingredient that I hated the idea of overpowering it with a marinade. 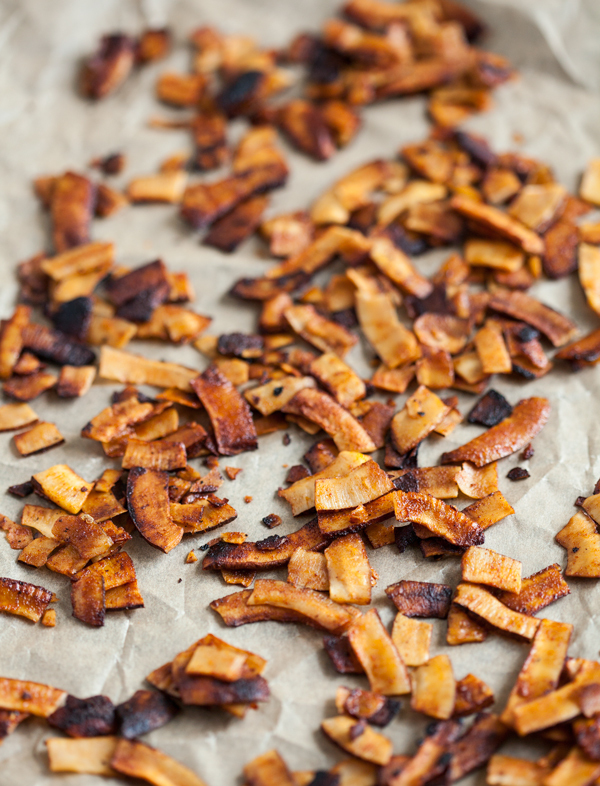 I think the easiest way to make coconut bacon at home is to use either large flake coconut or coconut flakes. Both are a form of dried coconut, but the pieces are large and chewy (rather than shredded or desiccated, as with much of the dried coconut you find in supermarkets). The texture is awesome–perfect for sprinkling onto salads or atop baked potatoes. If you’re having a hard time finding coconut flakes or large flake coconut, you can definitely find it on Amazon, and you can probably find it at a local health food store, too. 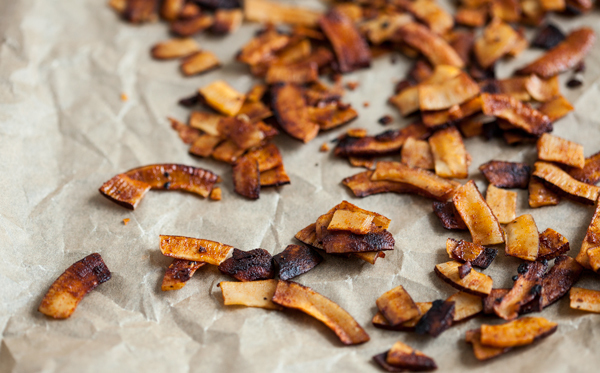 You can make this recipe for coconut bacon in your oven, or you can prepare it with a food dehydrator. 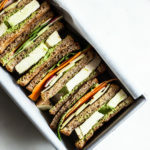 I love the oven version because it’s so fast and easy, but the dehydrator will help you to keep the flakes from burning as they cook, which yields even results. Though I must confess that I love the slightly burnt edges! Whisk the tamari, oil, vinegar, syrup, and paprika in a medium sized mixing bowl. Add the coconut and mix it around until it's all evenly coated. Allow the coconut to sit for at least ten minutes, so that it soaks all of the marinade up. Preheat the oven to 300F. Spread the coconut evenly over a foil or parchment lined baking sheet. Bake for 8-12 minutes, stirring halfway through to prevent burning (check the bacon at the five minute mark, because it cooks up quickly). Let cool completely before serving. You can put coconut bacon on soups, stews, sandwiches, wraps, baked potatoes, salads…my gosh, the list goes on. Right now, as you can see, one of my favorite uses for coconut bacon is to add a little salty, smoky, sweet flavor to avocado toast or avocado lettuce wraps. It’s divine, and the addition of freshly sliced tomato, if you have it, is even better. Hope you give this flavorful recipe a try. And I wish you a happy start to the week. This sounds yummy, I think I’d add a few drops of liquid smoke too. Liquid smoke is probably worse for you than bacon. You can get those coconut flakes at the Tenleytown/Friendship Heights Whole Foods. And at the Yes! Organic Market in Cleveland Park. Love them! This, along with some chopped dried figs, would make a hearty and delicious topping for oatmeal. I’ve always shied away from making coconut bacon because most recipes require hacking into a fresh coconut, which I can never find at the grocery store. Thanks for providing this easier option! Umm, there’s a comment up there about liquid smoke being worse than bacon? Not so sure about that. From what I know, I could be wrong, but liquid smoke has nothing to do with animal products & is a good way to add flavor to barbecue-style foods & when I’ve used it I use 1/8th of a tsp. for a whole pot of beans. Do you know much about this, Gena? Also, love this concept! I remember when I first went vegan & Coleen Patrick-Goudreau saying in one of her podcasts that we don’t crave meat itself, but what meat is, which is texture & flavor. If you can replicate that in the plant world, well then, perfect replacement (& nobody had to die in the process!). Yum! I’ve been wanting to try!! The best sandwich I’ve ever had was smoked coconut BLT at Tori’s Bakeshop in Toronto. They even make their own bread; heaven! Ok, my problem with these is that I make a batch to use as salad toppers but the whole batch of them becomes my dinner instead. I’m probably going to make them again anyway though because I saw this post… lol. Ah I can see the bag of coconut flakes in the pantry right now. Yep, there they are. How is it possible I’ve never heard of this before? It looks amazing! I’m getting closer and closer to investing in a dehydrator. 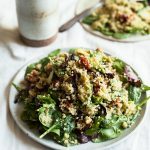 We’ve been learning about raw foods in my health coaching program (lots of David Wolfe lectures) and now I’m inspired to get creative with raw dishes! 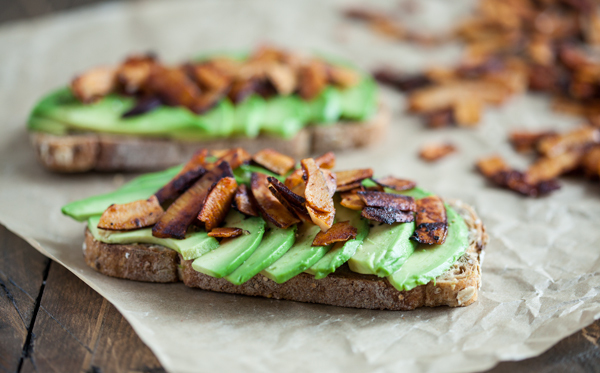 I’ve only ever had tempeh bacon… this coconut bacon sounds WAY more appealing and better to make (and eat)! 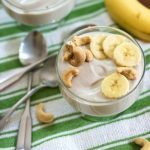 Yum 🙂 That’s my idea of a simple yet satisfying raw vegan lunch. I’ve also tried that brand before and it is my favorite of the dried coconut available. I am surprised you didn’t use liquid smoke or smoked salt. But I also like the idea of your “cleaner” version. It was mostly laziness and lack of prepared-ness — no liquid smoke at home! But it was totally delicious, as is. Looks amazing, can’t wait to try it! I’ve also found “coconut chips” (flakes) at the big Hispanic market up in Mount Pleasant (I’m totally blanking on the name but its right next to where they have the Saturday Farmer’s Market). I’ve made coconut bacon a few times now, but always with the liquid smoke-i seem to put it on anything and everything! I added some to my dried fruit/nuts/crackers snack mix and it was a revelation…..
That coconut, maple and tamari is NOT raw. Maybe you should just call it “partially cooked”? Sounds good though! I drop a comment when I especially enjoy a article on a site or I have something to contribute to the discussion. It’s a result of the fire communicated in the article I read. 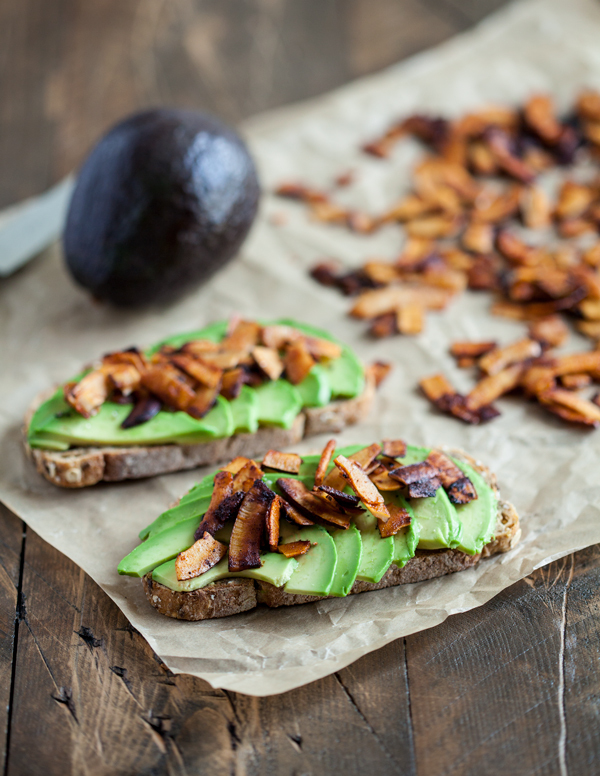 And on this article Coconut Bacon Recipe, Raw or Cooked. Yes, I too add liquid smoke. I’m going to try the paprika. Jenn, I’m so happy that your family loves the coconut bacon. Black strap molasses can be used in lieu of liquid smoke. I am going to make this today. Wondered if anyone can tell me the difference in taste between using maple syrup and molasses. Most of the recipes I’ve seen have all the same ingredients but some use the syrup and others use the molasses.